On ESPN’s First Take program Thursday, former Patriots linebacker Tedy Bruschi became the latest player to fire back at Max Kellerman’s takes on the Patriots and Tom Brady’s demise. For nearly two years, Kellerman has stood by feelings that Brady will ultimately fall of a “cliff” production wise. Throughout the 2018 season, Kellerman and a variety of other media outlets didn’t give the Patriots much of a shot to compete for a Super Bowl. Despite it all, the Patriots find themselves back in the AFC Championship game for the eighth consecutive season. First Take had Bruschi come on to defend his former quarterback and he didn’t disappoint, he went straight at Kellerman. 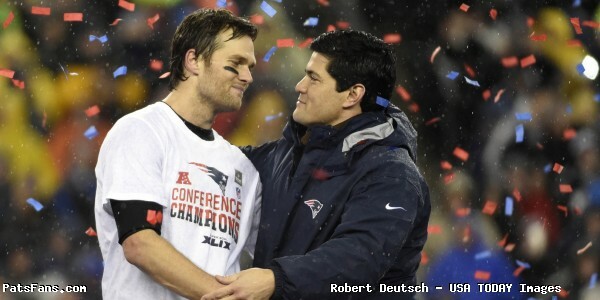 Bruschi’s comments continued a trend of Patriots not afraid to shy away from their feelings of disrespect by the media. On Instagram Wednesday, Julian Edelman shared a hype video entitled “Bet Against Us” and later that day, linebacker Kyle Van Noy also called out Kellerman for his Patriots opinions. At any rate, after 16 years of “ignoring the noise” its clear the Patriots have had enough staying silent, and they’ll look to reach their third Super Bowl in a row with a win Sunday night in Kansas City despite what everyone else thinks. It remains New England vs Everybody. This entry was posted in 2017 Patriots Postseason, Patriots Commentary, Patriots Twitter, Patriots Video and tagged Julian Edelman, Kyle Van Noy, Tedy Bruschi on January 17, 2019 by Robert Alvarez. Can the New England Patriots Keep Free Agent Rex Burkhead? The Patriots will enter the beginning of the 2018 league season with several important decisions to make in regards to free agency. Among the veterans looking for a new deal are Nate Solder, Danny Amendola, Malcolm Butler, Dion Lewis, Rex Burkhead, Nate Ebner and Matthew Slater. There are other veterans such as Brandon Bolden, James Harrison, LaAdrian Waddle and Cameron Fleming who have played significant roles at times and have been limited in others. The Patriots have only $13.14 million dollars under the salary cap right now and will have to be creative in creating some room as well as decide who they want to retain. They’ll need to sign a few of their own free agents as well as grab some others who they covet from other teams. All the while knowing they have draft choices to sign. We’ll be doing profiles on each of the free agents in the upcoming days and give you our take on whether they return or move on. One of the more intriguing players facing free agency is running back Rex Burkhead. The Patriots made a very nice move last spring grabbing Burkhead off of the free agency pile in an under-the-radar move from the Cincinnati Bengals. Burkhead was stuck behind two very talented backs and didn’t see the field much. They signed him for the modest price of $3.15 million dollars. The team liked his versatility, he can run the ball between the tackles, catch it out of the backfield and play a key role on special teams. We knew he’d fit right in here and it was easy to see that the coaches liked what they saw as well. Burkhead was injured a couple of times this season and played in just 10 games in the regular season. And that may work in the Patriots favor this season. He showed the team he is an excellent fit in what they do and his two injuries last season may scare away, would-be suitors from investing heavily in a guy that they’re not sure if he can hold up for the long term. 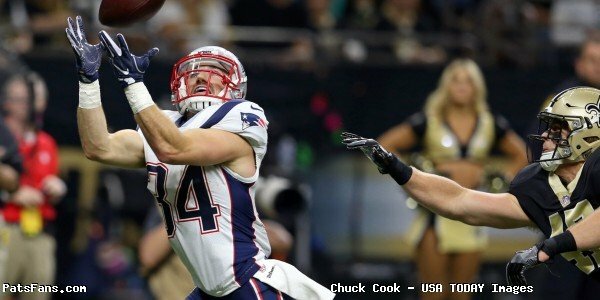 Why Burkhead Won’t Return: There are enough of Burkhead’s good work with the Patriots on tape to show other teams what he can do. And let’s face it, the Patriots don’t pay their running backs to retain their services. They let them walk to other teams. 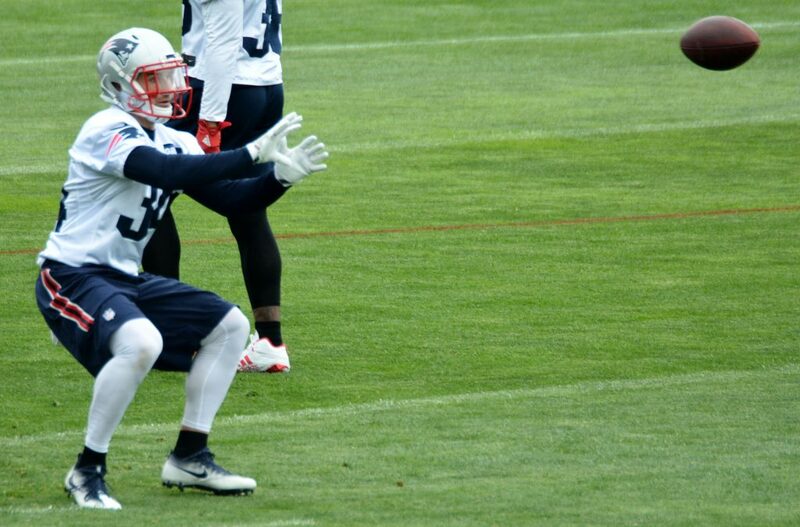 Stevan Ridley, BenJarvus Green-Ellis, Shane Vereen and Danny Woodhead ring a bell? All of them had fairly good success here in New England. Then when it was time to get paid, they moved on, just like LeGarrette Blount did…twice. Players like him are rare, he can play four downs and do it all. If a team comes in with an offer that blows him away, he’d be foolish not to consider it. Careers in the NFL are woefully short and so is the window of peak earning potential. And Burkhead is right there. He’ll be 28 this season. And of course, the Patriots could have cold feet themselves. Burkhead was injured twice last season and a Belichick mantra is availability is very important. Could they decide to walk away because of injury concerns? Absolutely. Bottom Line: The Patriots love the selfless, egoless attitude of Burkhead. Bill Belichick lauded his work ethic speaking of him before the Super Bowl. Burkhead saw that for the first time he was given a chance to play meaningful snaps in an offense. And he thrived in it, before getting dinged up. He seemed as happy here as the coaches and other players were to have him here. Both he and Dion Lewis are free agents this spring. Lewis had much more production this past season and is extremely elusive in the open field. If there is one back who will get a lot of money offered upfront, it is him. Again this could work in the Patriots favor. They aren’t going to break the bank for Lewis and if another team scoops him up, the team could throw some decent but not crazy money after Burkhead on a short-term (2 years) deal that could lock him up for the foreseeable future. Various cap-based projections put Burkhead in the $3.3 million dollar range for 2018. That is a modest raise from what the Patriots paid him in 2017, but if they can work out a deal in that vicinity, then there is a very good chance of Burkhead returning. This is another intriguing decision that Bill Belichick and Nick Caserio will have to make this spring. On one hand, they both know what Burkhead brought to the table when he was available on the field. But they also know in his only season in New England, he missed a lot of time. This entry was posted in 2017 Patriots Postseason, 2017 Patriots Season, NFL Commentary, NFL News, Patriots Commentary, Patriots News, Patriots Rumors and tagged 2018 Patriots Free Agency, 2018 Patriots offseason, Bill Belichick, Dion Lewis, James White, LaGarrette Blount, New England Patriots, NFL, Patriots, Patriots running backs, Rex Burkhead, Tom Brady on February 16, 2018 by Steve Balestrieri. As the New England Patriots continue the process of moving on from the 2017 season, linebacker Marquis Flowers took to his Twitter account Monday to try and clear the air with those criticizing himself and his team in the aftermath of Super Bowl LII. Beginning with an article in the Boston Sports Journal by Greg Bedard that viewed Flowers Super Bowl performance as worse than the issue with Malcolm Butler’s benching, Flowers defended his head coaches decision making while also holding himself accountable for a bad game. Y’all gonna critique arguably the best coach in NFL History? Not on My Watch!! #NotOnDuty! When a fan pushed Flowers further on defending Belichick with a tweet that read “so you believe your teammate malcolm butler who you worked with all year the blood sweat and tears he didnt deserve to play???? did u tell him that marquis? ?” Flowers reiterated how those decisions were out of his control. To conclude his series of tweets, Flowers shared what a full season under Belichick helped him with most while also calling out a few internet trolls that wanted to give him a hard time. I had fun with y’all today, It’s All Love no hard feelings to anyone! 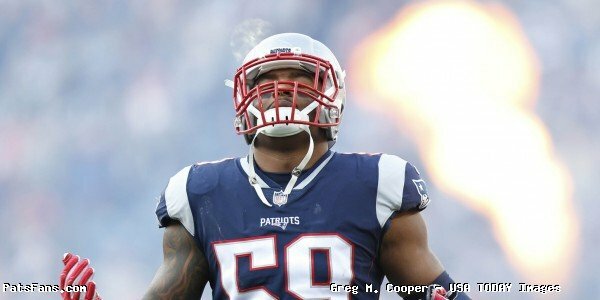 Flowers will head into the off season as a free agent, but judging by his defense and outpouring of emotion towards his time so far New England, he certainly learned a lot in just one full season. This entry was posted in 2017 Patriots Postseason, 2017 Patriots Season, Patriots Commentary, Patriots Twitter, Super Bowl LII and tagged Lane Johnson, Malcolm Butler, Marquis Flowers, Super Bowl LII on February 15, 2018 by Robert Alvarez. The Patriots will enter the beginning of the 2018 league season with several important decisions to make in regards to free agency. While the team has a limited amount of cap space, right now… they should be retooling a few contracts or cutting their ties with some players soon which will create more cap room. Check with our old friend @patscap for the latest on the salary cap goings on. We’ll be doing profiles on each of the free agents in the upcoming days and give you our take on whether they return or move on. One of the key players facing free agency is wide receiver, Danny Amendola. Amendola has heard the doubts since high school, recruiters told him he wasn’t Division I material but he made the team at Texas Tech. After going undrafted, he turned heads at the Cowboys training camp but was cut and then spent time on their practice squad as well as the Eagles. After he had success with the Rams when finally given a chance, he heard plenty of criticism when the Patriots signed him to replace Wes Welker. He’s not hearing it anymore. Amendola has become one of the Patriots biggest playmakers in the past four years. While he’ll never come close to 100 catches like Welker did in his time here, he’s become a crunch-time star, or as his teammates call him “Danny Playoffs” or “Playoff ‘Dola” for his penchant of big-time catches when the stage is the biggest. He has the surest hands on the team and it is a true rarity to see him drop a catchable ball. Amendola is also a versatile, hard-working player who will do anything asked of him and his work on special teams in the punt return game can’t be overlooked. He set up the game-winning touchdown (which he caught) against Jacksonville in the AFC Championship Game with a big punt return that set the Patriots up for the winning score. 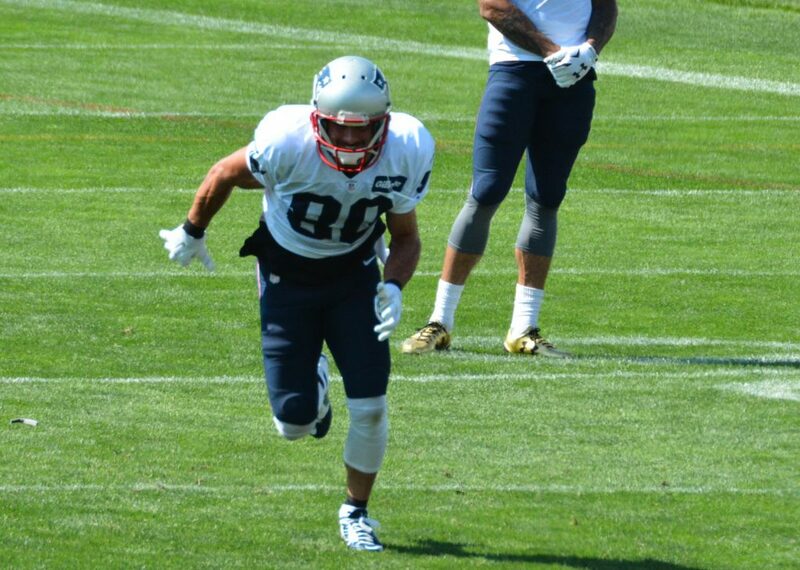 Why Amendola Will Return: The Patriots and Amendola have a good thing going for themselves. They’ve figured out a way to best utilize his talents and he’s thrived in it. He occupies a key spot in Tom Brady’s circle of trust. If you watched any of Brady’s “Tom vs Time” docu-series episodes, you’d see Brady, Julian Edelman, and Amendola working out before training camp together in Montana. That speaks volumes of how the QB feels about his wide receivers and how the bond between the three is cemented in hard work and trust. The three of them share a common bond that no one believed in any of them. And now they’ve won a pair of Super Bowls together and that collective chip on their shoulder will forever fuel them regardless of their success. Amendola has the toughness and the ability to do the dirty work in the middle of the field where he takes a beating at times. In his first Patriots game in Buffalo, he tore his groin muscle right off the bone and then played the entire season like that. The Patriots limited his pitch count this season, he played in just under 50 percent of the offensive snaps this season, because and especially so, once they lost Julian Edelman in the preseason, they needed a healthy and fresh Amendola for the playoff run. And he delivered once again. The team won’t have to break the bank for him, but they’ll have to pony up more money than they have in the past, where they’ve renegotiated his deal, seemingly every year. Why Amendola Won’t Return: There were concerns that if Josh McDaniels left for Indianapolis, that he’d try to entice Amendola into leaving with him and he’d become the invaluable piece that he was in New England with the Colts. McDaniels and Amendola have a ton of mutual respect for one another and that was a definite possibility. Now that one has been squashed as McDaniels is staying. There is still the off chance that a team will try to wow him with a bunch of money after his playoff run where he was outstanding in all three playoff games for the Patriots. And of course, the Patriots may decide to low-ball him so much that he feels like he has to move on and take the money elsewhere. But those last two scenarios are both of the low percentage variety. Bottom Line: The Patriots, as we mentioned above, have some interesting decisions to make this spring. This shouldn’t be one of them. Amendola is a proven performer on the big stage. His playoff run with 26 catches for 348 yards and two TDs is the production that elite receivers look for in the playoffs. While no one is saying he’s elite, however, he is, in this offense, invaluable. He has the absolute trust of his coaches and his quarterback. His toughness is unquestioned and he possesses the best hands on the team. His ability to find the openings in zone coverage and get open quickly in man coverage are perfect fits for the team. Furthermore, he loves playing here in New England, for this coach and this quarterback. He’s learned the Belichick method of answering questions at his press conferences, never giving much up and very much sticking to the company line. But during training camp, we were there when Mike Reiss asked him about his taking another pay cut and what his feelings were about coming back for another go with the Patriots. He made it very clear that there is New England and not much else in terms of where he wants to be. Check out the video clip. While there are some “must sign” free agents, let his name be at the top of the list. Chances of his returning should be around 90 percent for 2018. This entry was posted in 2017 Patriots Postseason, Patriots Commentary, Patriots News, Patriots Rumors and tagged 2018 Patriots Free Agency, 2018 Patriots offseason, Bill Belichick, Buffalo Bills, Danny Amendola, Julian Edelman, New England Patriots, NFL, Patriots, Patriots free agents, Patriots wide receivers, Tom Brady on February 12, 2018 by Steve Balestrieri. 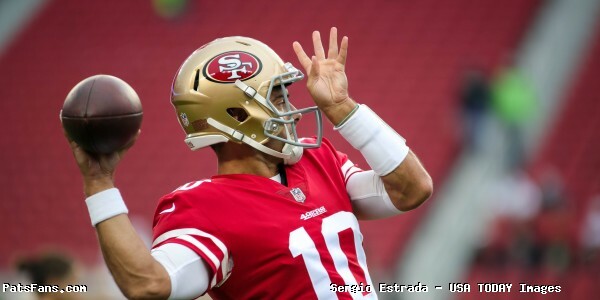 On Thursday, former New England Patriots quarterback and current San Francisco 49er Jimmy Garoppolo made headlines when he agreed to an NFL record 5-Year, $137.5 Million Contract. On social media, a few of Garoppolo’s old teammates in New England took time to congratulate him on his new deal and wished him well. @JimmyG_10 yo bubs, about the 20 dollars you owe me…. I mean …. congrats jimbo slice. People keep asking me do I think Jimmy G got paid to much and I say HELL NO. Good call @49ers no messing around they got the guy! This entry was posted in 2017 Patriots Postseason, Patriots News and tagged Dont'a Hightower, Jimmy Garoppolo, Julian Edelman, Rob Ninkovich, Sebastian Vollmer on February 9, 2018 by Robert Alvarez. It’s no secret the New England Patriots Super Bowl LII loss was celebrated by a lot of cities throughout the country Sunday night, cities who’s teams either aren’t very good and want the underdog or places that have become rivals with the Patriots over the years. Then there’s the NBA’s Atlanta Hawks, the 17-37 Atlanta Hawks. While its understandable the Patriots will never be liked by the peachtree city after the epic collapse of a year ago, it was a little strange when the city’s basketball team decided to be the first ones there to relish in the defeat with a shot at the Patriots. The Hawks tweeted out this “final score” when the game concluded. While it’s likely true America feels that way, maybe they should consider winning some games first? Congratulations on the championship tweet, pass the salt. This entry was posted in 2017 Patriots Postseason, Patriots Commentary, Patriots Twitter on February 6, 2018 by Robert Alvarez. This one won’t go down as a defensive struggle as both teams combined for nearly 1200 yards of offense and 84 points, but it was the Philadelphia defense that made the one big stop when Brandon Graham stripped Tom Brady of the ball and it was the Eagles and Foles who played tremendous all game long walking over the Lombardi trophy and a huge win in Super Bowl LII. Foles, who was the MVP completing 28-43 for 373 yards with two touchdowns and a pick. He connected with Zach Ertz for a touchdown with 2:21 left to give the Eagles a 38-33 lead but it certainly appeared that the call would be reversed. But the call didn’t matter a bit. It would have just 35-32 before the Brady sack. 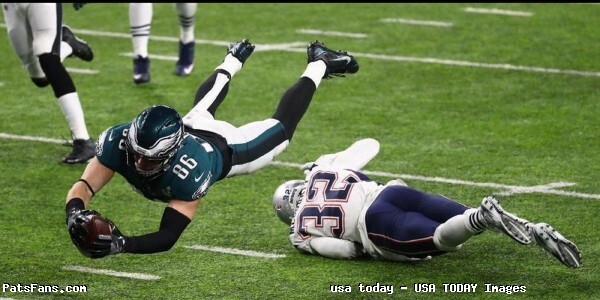 There were a couple of close calls in terms of what is or what isn’t a catch… but again, when the defense couldn’t stop Foles and the Eagles offense all game, that wasn’t the reason for the loss. It was simply another tremendous Super Bowl, maybe not if you like a defensive struggle in terms of drama, it doesn’t get much better. Right down to the final pass into the end zone as time expired. The Eagles made just one or two more plays than the Patriots did and that’s why they are the new Super Bowl champions. Doug Pederson said after the game that the Eagles wanted to stay aggressive with their play calling and they did and the Patriots were completely unable to stop them. Alshon Jeffrey was getting the better or Eric Rowe early in this game. Nelson Agholor was beating everyone the Patriots trotted out there against him. The Eagles identified mismatches they felt they could win and exploited them. Agholor had nine catches on 11 targets…he was uncoverable all game long. Zach Ertz had a very strong game and Corey Clement torched the Patriots for 100 yards receiving, including a 55-yarder where Jordan Richards took just a brutal angle on the play. Pederson’s best call was on 4th and 1 near the end of the first half, they ran the option pass to Foles. With him in the shotgun, no one accounts for him and he trotted all alone for a huge touchdown to put the Eagles up 10 at the break. The Patriots defense was dissected and shredded for over 500 yards of offense (374 passing, 164 rushing) by the Eagles who also gashed them for 41 points. The Patriots defense was manhandled up front by a very good Philadelphia offensive line that opened up big holes in the running game while giving Foles plenty of time to throw. The pass rush was missing most of the game, Trey Flowers had a very, very quiet Super Bowl and was not a factor at all. With the exception of Gilmore and perhaps Pat Chung, and James Harrison, it was their worst performance since Week 1. Matt Patricia and Bill Belichick didn’t have the answers this week. With the exception of moving Gilmore on Jeffrey, who was shut down, they didn’t make any adjustments that worked. They were out-coached in Minneapolis. It doesn’t happen often but it did tonight. Immediately after the game, I was reading criticism of Tom Brady which is laughable. Brady was shredding the Eagles defense in the second half as bad as they were being shredded. Brady threw for 505 yards and three touchdowns averaging 10.5 yards per attempt on the night. And the offense put up 33 points. I didn’t like the play call early in the game on 3rd and 2 with the end around to Brandin Cooks, where they were moving down the field, but that is the way the cookie crumbles, it could have been 40 with a better call. Cooks left with a concussion on an awful collision with Malcolm Jenkins but Brady and the offense reacted well and spread the ball around. Danny Amendola was his clutch self, catching 8 passes for 152 yards, Gronkowski had nine catches for 116 yards with a pair of touchdowns, nearly all of it coming in the second half. Chris Hogan had six catches for 128 yards and a score. Overall the Patriots had three players with over 100 yards receiving. With several players in the secondary struggling all game, it was more than curious that Malcolm Butler was benched for the entire game other than special teams. Bill Belichick said after the game that it wasn’t a disciplinary decision but a strict football one why he didn’t play. Butler, who was very emotional during the National Anthem, may have realized that his last game in New England (and the chances of him returning now are practically nil) was coming to an end in the worst way possible, by riding the pine. What had to be particularly galling for Butler was that the secondary was being gashed. With no one able to cover Agholor, in the biggest game of the year, was Butler the worst option between Rowe, Bademosi, Richards et al? Suffice to say, the team we see at the mini-camp in June will be quite different from the one that took the field tonight. Matt Patricia is gone. It was thought Josh McDaniels was gone too, but now, some in the media are saying to pump the brakes on that talk…at least for now. But the roster will see changes as the team will have several decisions to make in the coming days, which we’ll address later. Sorry New England, no parade this year, we’re on to the NFL Combine. This entry was posted in 2017 Patriots Postseason, NFL Commentary, NFL News, Patriots Commentary, Patriots News, Super Bowl LII and tagged 2017 Patriots Season, Alshon Jeffery, Bill Belichick, Brandon Graham, Chris Hogan, Danny Amendola, Dion Lewis, Doug Pederson, James Harrison, James White, LaGarrette Blount, Nelson Agholor, New England Patriots, Nick Foles, Patriots, Philadelphia Eagles, Rob Gronkowski, Stephon Gilmore, Tom Brady, Trey Flowers, Zack Ertz on February 4, 2018 by Steve Balestrieri. On Sunday, New England Patriots quarterback Tom Brady released Episode 5 of the Facebook view documentary series Tom vs Time entitled “The Spiritual Game”. For New England Patriots quarterback Tom Brady, football is more than a game – it’s a spiritual vocation. Football is what gives his life purpose. But the clock is ticking, Tom’s children are growing up fast, and his wife, supermodel Gisele Bundchen, is losing patience with Tom’s all-consuming devotion to his sport. Time is all we have – and Tom is painfully aware of it. How much longer can he keep playing the sport he loves? A sixth episode of the series will be released at a later date. This entry was posted in 2017 Patriots Postseason, Patriots Video, Super Bowl LII and tagged Tom vs Time on February 4, 2018 by Robert Alvarez. At the time of this posting, its officially Super Bowl game day in Patriots Nation for the eighth time in the Bill Belichick era. As with every leadup to a big playoff game, some of the Patriots best players shared hype videos across their social media accounts to get fans fired up and ready for the 6:30 kickoff in Minnesota. On Saturday, quarterback Tom Brady along with wide recievers Julian Edelman and Danny Ammendola all shared their own unique videos that you can checkout before or during your Super Bowl parties below. This entry was posted in 2017 Patriots Postseason, Patriots Twitter, Patriots Video, Super Bowl LII and tagged Danny Amendola, Julian Edelman, Tom Brady on February 4, 2018 by Robert Alvarez. Good morning, here are your Sunday’s Patriots news 2-4, & AFC East Notes. ***Update**** Tom Brady was announced as the MVP of the NFL, the third time that Brady has won the award. Julian Edelman accepted the award for Brady as he was busy preparing for Super Bowl LII. Happy Super Bowl Sunday, the Patriots are back for the third time in four years and with a win, they’d cap a double dynasty, the three wins in four years during the 2001-04 seasons and the run now. With the eighth appearance in the Brady, Belichick era in the Super Bowl it is amazing the extended run of success that they’ve had and worked hard to achieve. For those of us who grew up in the not-so-great years, it never gets old nor taken for granted. Julian Edelman did a pretty revealing interview this week at the Super Bowl, despite missing the entire season, he’s in Minneapolis with the team. We’ve got to see a lot of Edelman this week, on the Tom vs Time documentary with Brady, we saw the back and forth jawing the two and Danny Amendola share with one another but the incredibly hard work that goes into their workouts to build their chemistry and timing. But in regards to the Two Bills special, Edelman pulled no punches on his relationship and respect he has for Belichick. “I’m getting to witness greatness just being around him, I feel like I’m a part of it.” Indeed he is…a very big part of it. We’ve been hearing about the Eagles’ defense for two weeks, and they’re very good. They can rush the passer with four and not have to blitz but do so effectively when they send six or more as we’ve seen in some game tape. But if this game is close in the 4th quarter, and we believe it will be, don’t bet against Tom Brady and the Patriots pulling off some more fourth-quarter magic when the chips are on the line. And he’s done it against some very good defenses as well. In the 2014 playoff game and Super Bowl versus the Baltimore Ravens and Seattle Seahawks, Brady was a 17-18 with 3 TDs in the fourth quarter and leading the Patriots to come-from-behind victories. In the Super Bowl last season, Brady was a very impressive 21-27 for 246 yards in the fourth quarter and overtime sessions. In this season’s AFC Championship Game, Brady led two late fourth-quarter touchdown drives after being down 10 points. He tossed two touchdown passes to Danny Amendola. These are the kind of games where he steps up big at crunch time. Here are some interesting tidbits in terms of numbers for today’s Super Bowl. 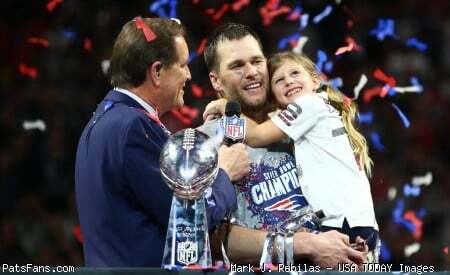 Haley (5) as the only other NFL player with five Super Bowl wins. 8 – Number of Conference Championships by Bill Belichick, the most in the Super Bowl era. Second place belongs to Don Shula with six. 8 – Number of completions Tom Brady will need tonight to reach 900 career postseason completions. 41 – Wins (regular and postseason) by three points or fewer, since 2001. The Patriots 41-17 .702 win percentage record in close games is the best in the NFL. Indianapolis is second with a 42-23 .646 win percentage. The “Two Bills”? A Fantastic Story: The ESPN 30 For 30 Series produced a classic and aired this week concerning the partnership and interaction of Bill Parcells and Bill Belichick. The lead-in for the show contrasts the bombastic “wanting to buy the groceries” Parcells with the dour, quiet Belichick. The Giants players called Belichick “Doom” because of his harping on the minutiae of mistakes he’d pick out from a game film. Belichick’s arrival in Minneapolis fed into that perfectly on Monday. Wearing a black fedora, “Doom” Belichick was like one of the capos in the Godfather. “Leave the gun, take the cannoli.” Of course, the truth is always somewhat different, sometimes vastly so. Parcells, looking a bit aged now at 75, his voice getting a bit raspy is a much more mellow and at peace with himself man now, than he was a few years ago. Although the two men have long since made their peace with one another, they were still both a bit guarded, but when they cut back and forth between the two men when airing fantastic interview clips with former coaches and players that played for the two, and even Patriots owner Robert Kraft, they’d share glances and smile genuinely. The two men have won seven Super Bowls between them and will be forever linked. They were the perfect combination. Belichick was the detail guy, he’d leave nothing to chance. Parcells was the master manipulator. As Lawrence Taylor said, “he always knew the exact buttons to push.” Together, they were a tremendous team and the coaching staff that Parcells built around those teams with Belichick, Romeo Crennel, Charlie Weis, Al Groh et al were fantastic. While the “Two Bills” didn’t really break a ton of new ground, it was a fascinating, well-done look at two very complicated, vastly different personalities that at the heart, shared a very common trait. The burning desire to be the best at their chosen profession. And when they worked together, they were a truly dynamic duo… led by Darth Vader (teaser alert). If you haven’t seen it yet, put it on the must-see list. The ending is an absolute classic. In the fascinating, docu-series that Tom Brady is airing, it gives an inside look at his life both inside and outside football that few people have ever been allowed to see before. The series has another segment which will air today before the Super Bowl and another segment which will air at a time TBD after the big game. Filmmaker Gotham Chopra was granted some pretty incredible access and Brady wanted to show certain sides of him that we’re never allowed to see, namely his family and despite uber-ridiculous cheap shots taken at him and his children by some twisted people, it has been a fascinating watch for not only die-hard Patriots fans but anyone who is looking for an inside look at the life of the very rich and famous. Chopra is an admitted die-hard Patriots fan who is excited (and rightfully so) about getting the chance of a lifetime. He spoke recently about wanting to show the different sides of Brady and not just football. As for Brady, he’s trying to show that he’s balancing the many facets of his life while letting people know what drives him. “I’m trying to find a deeper purpose,” Brady said. I don’t know about you, but I can’t wait for Sunday’s episode. This entry was posted in 2017 Patriots Postseason, 2017 Patriots Season, NFL Commentary, NFL News, Patriots Commentary, Patriots News, Super Bowl LII and tagged 2017 Patriots Season, Bill Belichick, Chris Hogan, Danny Amendola, Deatrich Wise, Dion Lewis, James Harrison, James White, Malcolm Butler, New England Patriots, NFL, Patriots, Patriots edge rushers, Rob Gronkowski, Stephon Gilmore, Tom Brady, Trey Flowers on February 4, 2018 by Steve Balestrieri.